We are thrilled to announce a new partnership with The Indigenous Literacy Foundation. The Indigenous Literacy Foundation (ILF) is a national book industry charity, which aims to reduce the disadvantage experienced by children in remote Indigenous communities across Australia, by lifting literacy levels and instilling a lifelong love of reading. 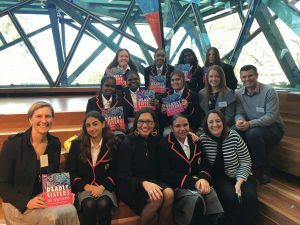 Celebrating Indigenous Literacy Day, some of the Campion Education team met the talented authors of The Deadly Sisters of Worawa and ILF Lifetime Ambassador Dr Anita Heiss (front, centre). “As an Australian company that is focussed on equipping Australian students for their education, the partnership with the ILF made good sense to us,” says James Cathro, Campion Education’s Managing Director. We’re setting an ambitious fundraising target for the Back-to-School period. In the new year we’ll be throwing our support behind the Great Book Swap to help the ILF raise funds to purchase books for remote communities throughout Australia. Support the ILF by signing your school up to host a Great Book Swap on Indigenous Literacy Day.